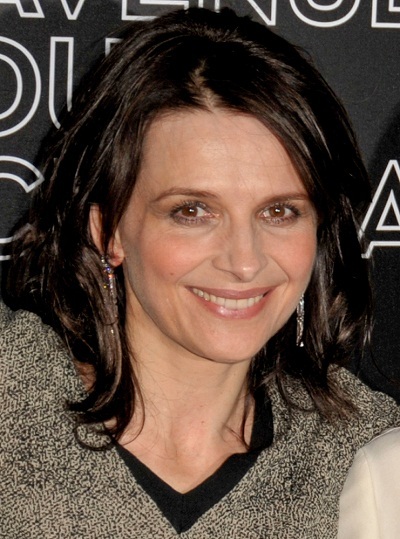 Juliette Binoche is an Academy Award-winning French actress, artist, and dancer. She won the Academy Award for Best Supporting Actress for The English Patient (1996). She has starred in more than 40 feature films. Juliette is the daughter of Jean-Marie Binoche, an actor, director, and sculptor, and Monique Yvette Stalens, a teacher, director, and actress. Juliette’s father is French, and he also has 1/8th Portuguese/Brazilian ancestry, making Juliette of 1/16th Portuguese/Brazilian descent. Juliette’s mother was born in Częstochowa, Poland. Juliette’s maternal grandfather was of Belgian [Walloon] and French descent, and Juliette’s maternal grandmother had Polish ancestry. Juliette’s maternal grandparents, who were Catholic, were imprisoned at Auschwitz because they were considered to be intellectuals by the Nazi occupiers. Juliette’s maternal grandparents were active in the theatre. Juliette has a son with her former partner, professional scuba diver André Halle; and a daughter with her former partner, actor Benoît Magimel. Juliette’s patrilineal ancestry can be traced back to her eight times great-grandfather, Edme Binoche, who was born, c. 1614, in Saint-Aubin-Chateau-Neuf, Yonne, France, to Edme Binoche and Germaine Loup. Juliette’s paternal grandfather was Georges Marie Binoche (the son of Henry Jean-Baptiste François Félix Henri Binoche and Louise Mélanie Marie Brunet). Georges was born in Boulogne, Hauts de Seine, France. Jean Baptiste was born in Rio de Janeiro, Brazil. Jean Baptiste’s father, Adolphe Binoche, was French, born in Champs sur Yonne, Yonne, France. Jean-Baptiste’s mother, Ursula Rosa de Araújo Mattos/Matos, was born in Saracuna, Pilar de Iguaçu, Brazil, the daughter of José Pedro de Araujo Matos and Inácia Antonia do Amaral. Ursula’s family lived in Brazil for many generations, some since the 1500s. Ursula’s ancestry was largely or almost entirely Portuguese. Juliette’s great-grandmother Louise was French, born in Paris, France, the daughter of Louis Claude Brunet and Marie Victoire Guillaumin. Juliette’s grandfather Georges died in Agadir, Morocco, but Georges had no Moroccan ancestry. Juliette’s paternal grandmother was Marie Antoinette Alix Gabrielle Personnaz (the daughter of Léopold Jean Joseph Personnaz and Geneviève Elisabeth Marie Gabrielle Morot). Juliette’s grandmother Marie Antoinette Alix Gabrielle was born in Sévres, Hauts de Seine, France. Léopold was born in Bayonne, Pyrénnées Atlantiques, France, the son of Gabriel Louis Jean Personnaz and Charlotte Catherine Alix Daguerre. Geneviève was born in Paris, the daughter of Nicolas Théophile Morot and Gabrielle Marie Oeschger. Juliette’s maternal grandfather was Andrzej/Andre Stalens (the son of Henri/Henryka Stalens/Stalensa and Marie Rosalie Houzé). Andrzej/Andre was born in Częstochowa, Poland. Henri/Henryka was born in Wattrelos, Nord-Pas de Calais region, Northern France, on the border with Belgium, the son of Jean Baptiste Stalens and Léonie Joseph Desmulier. Henri/Henryka had both Belgian (Walloon) and French ancestry. Juliette’s great-grandmother Marie Rosalie was born in Lannoy, Nord, France, the daughter of Pierre Joseph Houzé and Rosalie Marie Joseph Broutin; she had Belgian (Walloon), and possibly French, ancestry. Juliette’s maternal grandmother was Julii Heleny Młynarczyk (the daughter of Pawła/Pawel Młynarczyka and Anieli Melon). Julii was born in Częstochowa, Poland, and had Polish ancestry. According to that, Binoche’s grandmother was Jewish, but I can’t find anything to corroborate it. Maybe you can Follers. Juliette herself doesn’t say that her grandmother was Jewish. Rather, the interviewer writes, “It’s not surprising to discover her Jewish roots, and that in fact she spent a lot of her childhood with her maternal grandmother, a Holocaust survivor”. That sounds about right, given that Juliette’s grandmother’s name, and those of her parents, don’t sound particularly Jewish. I think the interviewer just assumed her grandmother was Jewish because of what happened to her during World War II. Btw, can we have a pic?? That first family tree link is very detailed. As you can see, her grandfather wasn’t actually Moroccan. I don’t know why the internet said she is Flemish. Her ancestors had extremely French (Walloon) names.